My oldest daughter has recently been put back on a low salicylate way of eating to help address some inflammation. While we are mostly paleo now at home, almond and coconut are both extremely high in salicylates and so they are off the table for her for a few weeks. Because she also needs to avoid a number of other foods as well, I needed to come up with a quick and easy snack for her, as it is not always practical and possible to eat meat and vegetables. 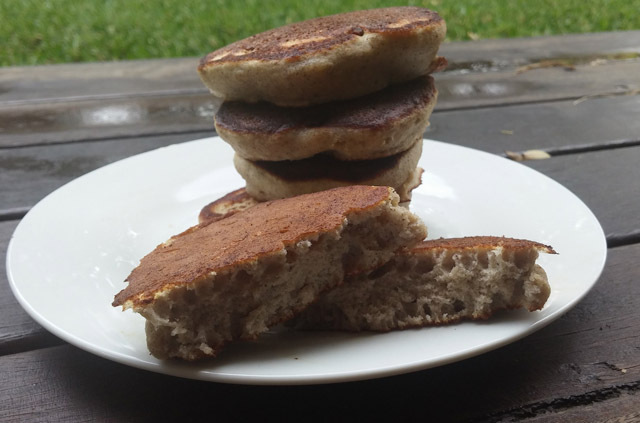 As I know she tolerates buckwheat very well, I decided to come up with a pancake recipe that used approved ingredients and left out potato or tapioca starch which is usually used to make a recipe lighter and fluffier. These were an amazing hit, even my very fussy and hard to please 6-year-old loved them so they are going into the make again list. 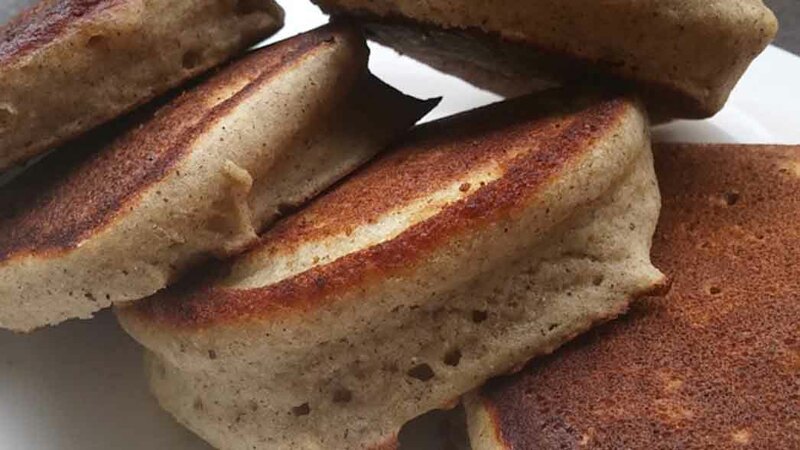 I used cashew milk for these, which has a lovely creamy taste and texture, and I believe adds to the fluffiness of the recipe. I originally used this recipe from Yummy Goodness and soaked my cashews overnight, rinsed them and then blended with fresh filtered water and a pinch of sea salt. Since then I find it easiest to weigh 75g of cashews to 500g of water plus a pinch of salt and blend speed 10 for 1 minute which gives me just the right amount to fill a recycled glass bottle that fits perfectly into my fridge door. The banana adds natural sweetness and they were delicious just plain or with a smidge of butter for the dairy tolerant among us. I didn’t eat them but my taste testers tell me they taste like banana bread. 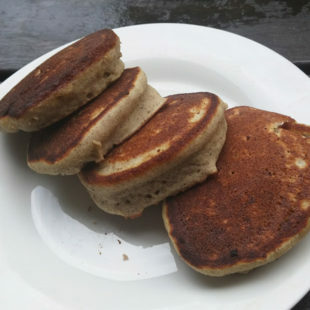 These pancakes are low salicylate but contain amines due to the ripe banana. If you don’t need to be low chemical 1/2 tsp of cinnamon would be lovely. 1 ea ripe banana mashed till smooth. 1/2 cup cashew milk I make my own or use your preferred milk. Mash banana well until creamy. You can do this by hand or I threw banana and eggs into TM31 thermomix and blended 5 seconds/speed 6. Combine rest of ingredients and mix well by hand or 10 seconds/Speed 6 thermomix. Mix should be a nice pancake batter, tending to the slightly thicker consistency. Depending on size of your banana you may need to use slightly more or less milk to get right thickness. Cook as normal for pancakes. I used ghee but you can use whatever oil you prefer. Pancakes cook better if you use a little oil/butter/ghee for each batch. The total number of pancakes served three hungry people but the number will vary depending on the size of your pancakes, I made them quite small.